Biofilms are small ecosystems usually consisting of three layers of differing thickness, which change in thickness and composition with location and over time (Meyer-Reil 1996). In the first phase of colonization, macromolecules are adsorbed at clean solid surfaces (proteins, polysaccharides, lignin; Wingender and Flem-ming 1999), because they are transported from the bulk liquid to the solid surface faster than the microorganisms are. As a consequence of this adsorption, the coverage of the solid surface with water is reduced. During the second phase, microbial cells attach to this prepared surface. Frequently, they do not form closed layers of uniform thickness, rather they form small attached colonies, which may spread by growth and further attachment. Usually, these cells are supplied with substrate and oxygen and are able to grow at their maximum rate. During this process, they produce organic molecules, which diffuse through the cell wall and to extracellular polymeric substances (EPS) catalyzed by exoenzymes. These EPS molecules are necessary for the formation of a stable biofilm (Wingener and Flemming 1999). In the third phase, the biofilm may consist of bacteria and EPS, the thickness of which is a function of growth rate and depends on the stability of the biofilm and the shear stress of the flowing water (Van Loodsrecht et al. 1995). At lower shear stresses, eukaryotic organisms (protozoa, insects, their eggs and larvae) typically establish themselves. All these organisms live in a community. Materials such as substrates and oxygen are transported into the biofilm by diffusion and convection and the products are transported out of the biofilm. Oxygen may reach only into the exterior part of the biofilm, resulting in a growth of aerobic microorganisms such as nitrifying bacteria and protozoa. 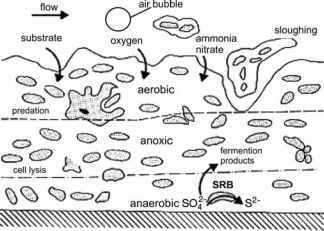 Nitrate and nitrite produced in this layer are reduced by anoxic metabolism within a middle layer, resulting in an anaerobic interior layer directly at the solid surface, where acetic acid and sulfate may be reduced (Marshall and Blainey 1991; Fig. 7.1). 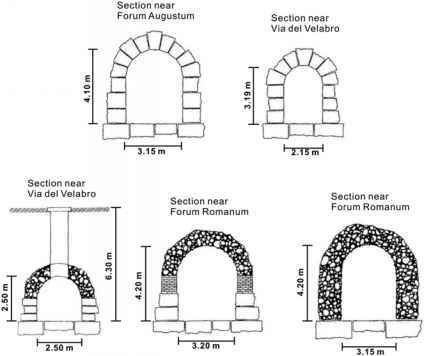 Fig. 7.1 Biofilm model (according to Marshall and Blainey 1991). The formation of biofilms is a requirement for their effectiveness. This chapter will describe these bioreactors and their application and will discuss some models of the processes, which are useful for understanding how they function.